DULUTH, Minn. (AP) — You wouldn't know Duluth Pack had become so cool by walking through its century-old factory, a cramped, busy place in Duluth's Lincoln Park neighborhood where workers are turning out hand-made backpacks pretty much the same way it was done in 1911. Huge bolts of canvas and stacks of tanned leather crowd shelves and aisles. Lines of sewing machines buzz away with women, and one man, hunched over intently. A guy with a hammer pounds rivets in a side room. But the iconic canoe pack manufacturer has turned "Made in the USA" into a status symbol in recent years with made-in-Duluth gear so cool it's selling at New York's haute Barney's department store, at Urban Outfitters nationwide and the flagship Carhartt store in Chicago. "We're selling our Duluth-made packs in Hong Kong now," said Tom Sega, Duluth Pack's president. "Sales in Europe, Tokyo - even Seoul - are really strong." It's gear so cool that New York Times fashion writer David Colman wanted in on the Duluth Pack vibe. Colman designed a day pack for Duluth Pack in 2009 - a smaller, slightly modified version of the old canoe trip favorite - that's now become the runaway best-seller for the company, especially in Europe and Asia. 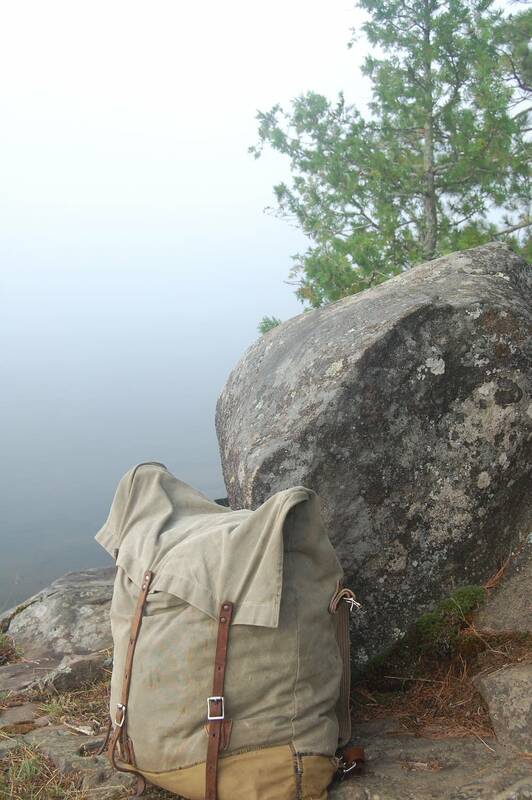 The $95 "Scout" is nothing fancy, just a canvas day bag with two leather straps and the Duluth Pack leather logo. But it's become all the rage with college students and urban explorers "who would like to get out into the wilderness more than they really have time to go," Sega said. A slightly larger and bit fancier model tentatively called the "Scoutmaster" is in the works. "I had these distant memories of my family using these great big green backpacks on treks in Glacier Park when I was little," Colman said in a statement. "So I've always wanted a pack just like the ones I remember. But I just figured they were lost with time. One day (while) researching a story, I stumbled across the Duluth Pack website, and I thought, 'This is it!'" Colman said the Scout pack is so cool and functional that he has "equal cred in New York City or in Glacier Park." More cool is that NBC got in on the act, prominently featuring Duluth Pack's traditional "Wanderer" pack for all of its contestants on each episode of the "Love in the Wild" reality show (airing at 9 p.m. on Wednesdays this summer). The newly matched couples all carry Duluth Packs as they travel the wilds of Central America. Sega said he is constantly asked when the company will expand into a new factory, maybe move out of Lincoln Park to a new part of town or a new city altogether, or offshore to Asia where most of their competitors' products are made. But that's not in the works for now. Duluth, Minn., is still stamped on everything they make. "I think where and how we do this is a big part of the heritage. This building has so much history," Sega said. "We see ourselves as caretakers for this great American heritage name and business." That old-school quality is how Sega got involved in the company in 2007. A frequent traveler in the paper mill machinery sales business, Sega noticed that Duluth Pack stuff outlasted everything else he owned. As he built up more and more Duluth Pack items, Sega eventually decided to inquire. He convinced Duluth Pack's two silent owners in Fargo, N.D., to let him buy into the company. Sega, a Duluth East graduate, is now the CEO and partner with the silent owners, along with another Duluthian, Mark Oestreich, Duluth Pack's chief financial officer. The team has more than doubled sales and grown their payroll. The factory now employs 40 - including 18 full-time sewers, up from six when Sega came on board. If sales become much better, the company probably would look at adding a second shift of fabric cutters, sewers and riveters before it would move to new digs or farm work out, Sega said. While the lone Duluth Pack retail store in Canal Pack remains an important part of the company's business, the company is rapidly expanding its dealer network to get more products into more retail stores worldwide - both under the Duluth Pack label and retailers' own brands. And it is marketing heavily on Google, Facebook and Twitter. The high cost of printing and mailing catalogs has shifted more sales to the Internet, Sega said, with the Duluth Pack website now accounting for 30 percent or more of the company's business, up from 10 percent in 2007. Duluth Pack also contracts with companies to make products under the customer's corporate logo. After a couple of down years in 2008 and 2009, when the global recession slowed business, Duluth Pack is enjoying a sales resurgence. The Canal Park store's sales are up 25 percent over 2010 and Internet sales are up 50 percent over this time last year. The Asian market has been especially good. "Everything we make is a `want' as opposed to a `need,' and a pretty high-end `want' at that. . When people cut back, that hurt us," Sega said. "But 2010 was very good year. And 2011 is shaping up to be our best year ever." Sega said the company's most frequent complaint is that its products are too expensive when compared to mass-produced, mass-marketed gear made in China. But that's the point, he noted. "We pay American wages. Every employee gets health benefits and life insurance and a 401K match ... the same benefits as I get. And there's a cost associated with that," Sega said. "But it clearly is a cost that a lot of people are willing to pay to get that 'made in America' heritage — and for a quality product that they're probably going to have the rest of their life." The Duluth Pack has been made in Duluth for 129 years, the last 100 years in the same building at 1610 W. Superior St.